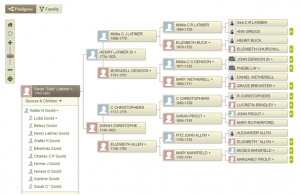 I frequently encounter eighteenth- or nineteenth-century dates, especially on the migration trail, that are not cited and which often derive from “online trees,” usually the FamilySearch Ancestral File, Rootsweb WorldConnect, or Ancestry World Tree. 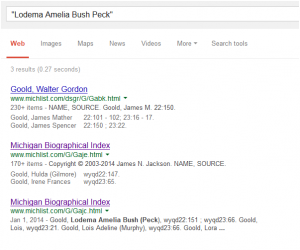 These days, I find it easier to determine whether any of the information is valid thanks to the many works and databases indexed at Google and Google Books. The following case suggests the variety of trails the researcher must be prepared to follow, from unverified online trees (which may hold important clues) to books and newspapers contemporary with the events mentioned (and which are sometimes flawed). On Ancestry World Tree, several trees identified her as Sarah “Sally” Latimer, daughter of Henry and Sarah (Christophers) Latimer of New London, Connecticut. They also gave her a date of marriage at Montville, Connecticut on 15 January 1785 and a death in Orleans County, New York, on 26 April 1853. In reviewing the charts online, I recognized lines of both her purported father and mother going back to Mayflower passenger William Brewster: Henry Latimer would be in the sixth generation and Sarah Christophers in the seventh, both descending from William’s son Jonathan2 Brewster. I went to the Mayflower Five Generations in Progress volume by Barbara Lambert Merrick. 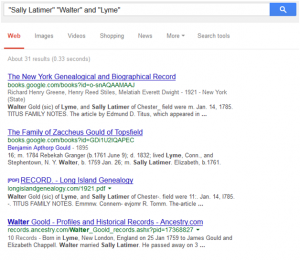 Both lines were confirmed to Henry Latimer as a child of his parents and Sarah Christophers’ father as child, but neither line continues to Sarah Latimer and her marriage. Henry Latimer died in New London in 1825, but he did not leave a will identifying heirs. 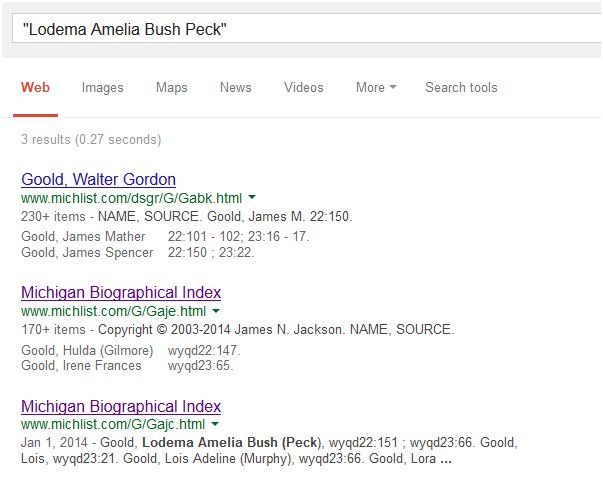 I decided to do a bit a Google searching. The New York Genealogical and Biographical Record 52 : 32. 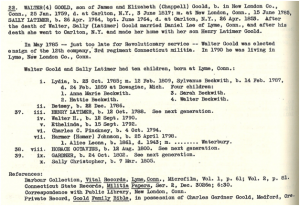 Howard R. Goold, “Descendants of Robert Goold Who Came to America in the Year 1665,” The Detroit Society for Genealogical Research Magazine 22 : 100. Getting a death record in western New York in 1853 can be difficult. Usually you are limited to gravestones or death announcements (if that), since deaths were not civilly recorded. 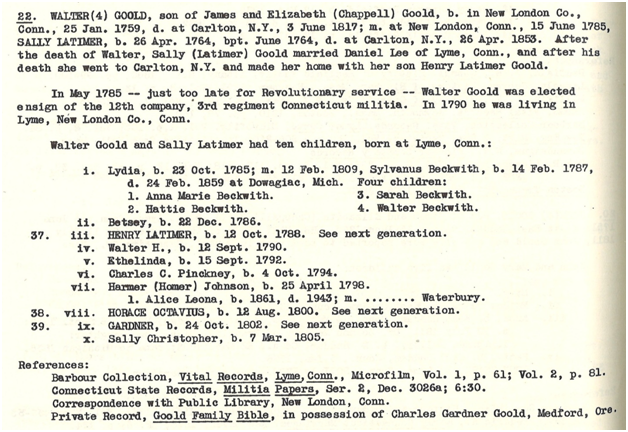 Even in Connecticut, while death records were kept in this period, the record usually did not list spouses, and almost certainly will not list parents. 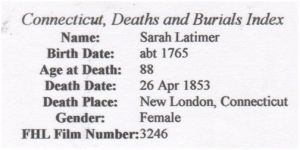 This newspaper’s death announcement of a New London native who died in western New York not only lists both of her spouses but also her father, giving me all the proof I need to extend her ancestors back in Connecticut and Massachusetts for seven more generations! Thank you for such good researching hints. A few I never thought to do. Maybe now the mortar in a few of my brick walls will start to crumble a wee bit with your information. Yes, thank you for the tips. One point I would like to add, and I just experienced it this weekend, is that FindAGrave may not always be accurate. I have an ancestor whose headstone clearly states Died 1857 Aged 83 yrs. The birth year is listed as 1778. If you subtract 83 from 1857 you get 1774. I wrote to the person managing that memorial and the response was, “A few years is not gonna matter.” I have requested a note be added to the marker transcription so we’ll see if that works. Yes that is true and happens a lot. Unfortunate. Great article thank you. As with the person above sometimes what we learn causes me to have to start over again on some things. 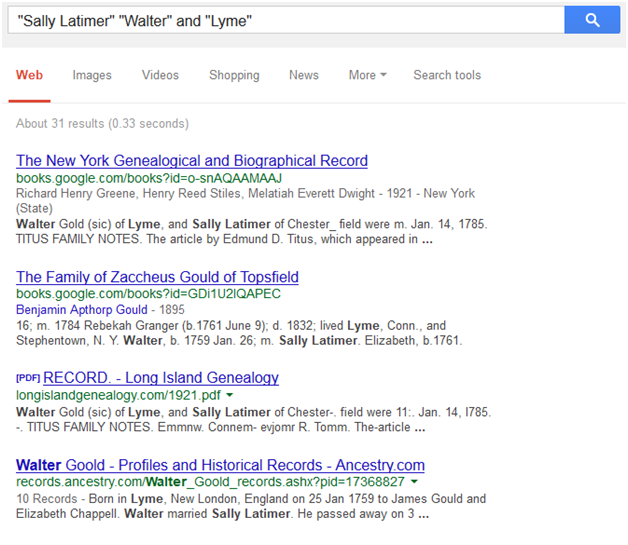 At first I was searching through records of the wrong family someone with the same last name as mine. Luckily they had a genealogist in the family and they put me on track. Happily one of my ancestors wrote a book so now I compare it to what I find on line. But the Internet has been a treasure trove. I have found birthdates on some of the sites thatt came after the date of death. But your tips are wonderful and you gave me a new resource. I grew up in Michigan and now I have another database to look at. This one is geared for people like me who grew up there. Newbie here – just subscribed through a link. What does ICYMI stand for, please? Thank you so much for this fine example of what I end up doing most Saturday mornings! Now I can share and people can understand better my obsession with genealogy AND the work involved in online research. Little off-topic but something I run into often is that members of my family who are part of Puritan communities often had several adopted children. They never Give the names of the children It makes me curious how those of us doing research might find ancestors who might have been adopted by other families? Have any of you ever written a story on this topic? It’s something I keep running into.